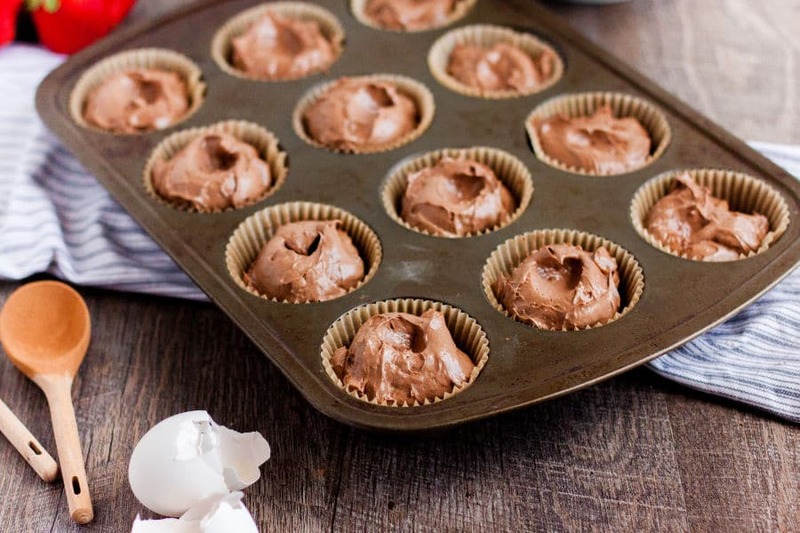 If you are looking for a low carb dessert option, these quick and easy Keto Chocolate Cheesecake Muffins are the perfect way to start or end your day! 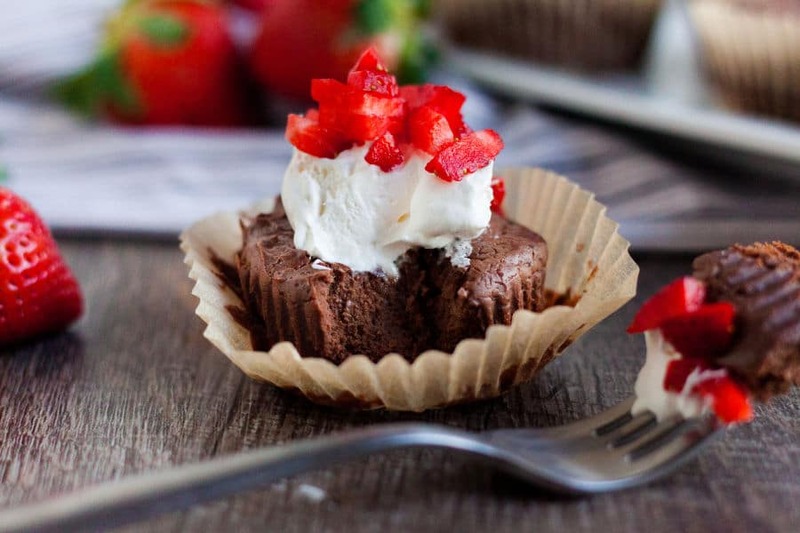 Finding a good dessert when living the Keto lifestyle doesn’t have to be hard. I talk to so many people who state that it’s one of their biggest fears of going Keto – losing flavor and great food options. I honestly can’t disagree more. Ever since my husband and I transitioned to eating Keto, I don’t feel like we’ve missed out. When we first started the Keto diet, I had to change my mindset, but once I did and fully embraced it, I can’t imagine not eating Keto! If you are new to the Keto lifestyle and aren’t sure where to start, check out the best keto resources for newbies that will guide you in your research. I always say that research is your best friend so that you can be your best health advocate. The key to a good cheesecake muffin? 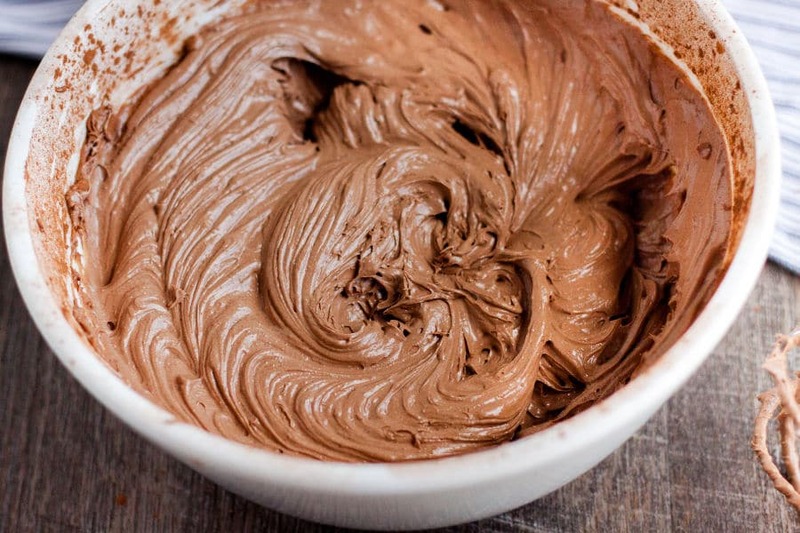 For this recipe to have that “wow” factor, make sure that your cream cheese is thoroughly softened first so that your Keto Chocolate Cheesecake Muffins are nice and smooth before baking. I use real Philadelphia cream cheese in recipes instead of the generic variety as the generic brands typically contain more carbs and additional ingredients. I’m almost positive chocolate is a universal love language. One of the biggest reasons that I love this recipe is that it’s super simple to make with only five ingredients, but tastes like it took a long time. It’s one of those super easy recipes that come out perfect every single time. Even if you aren’t a baker, this recipe is so easy to make. I use a cookie scoop to get nice even muffins and my muffin pan stays mess-free making it much easier to wash later. Anytime I’m baking desserts that require; I always make sure to use 100% pure vanilla extract. I just find that it tastes so much better than the imitation variety. I recommend using parchment paper muffin liners. You can find them on Amazon here. 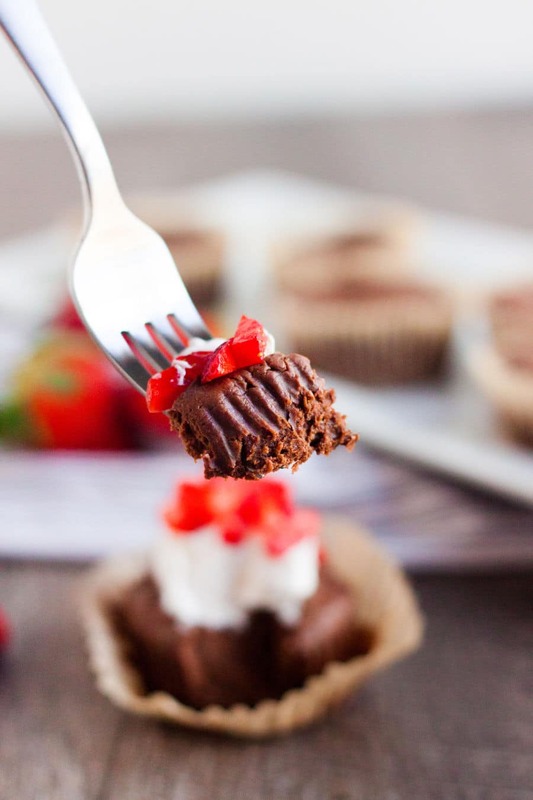 They make such a huge difference because nothing sticks at all leaving beautiful Keto Chocolate Cheesecake Muffins. And for toppings? Add some fun berries that are in season or some delicious homemade whipped cream. 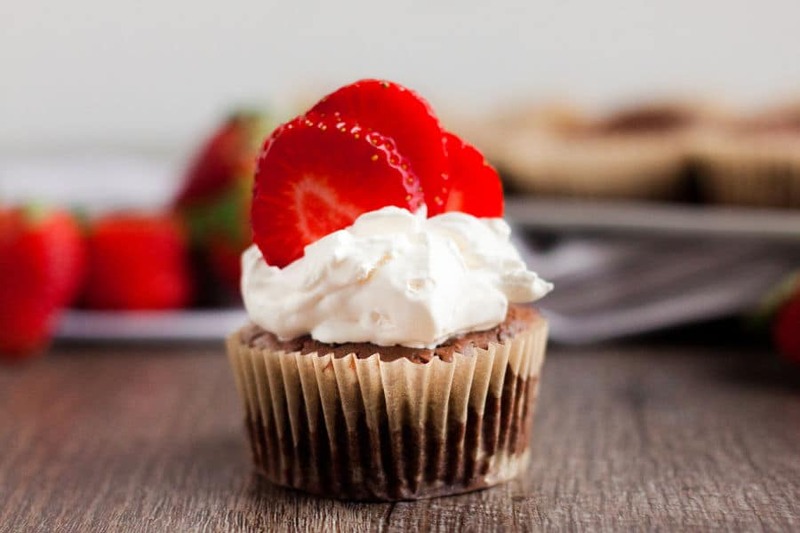 I prefer these Keto Chocolate Cheesecake Muffins with strawberries, Lily’s Chocolate Chips, and whipped cream. Truly, you can add whatever keto friendly toppings that suit your taste. I store the Keto Cheesecake Muffins in the fridge for 7-10 days in an airtight container. If you find that you can’t eat them all, you can always freeze them for up to 6 months. I recommend freezing Keto Chocolate Cheesecake Muffins individually that way you can grab one out at a time to enjoy rather than having to thaw them all together. Yes, they are as delicious as they look! This recipe is so versatile. You can add and subtract different ingredients and completely change the recipe. 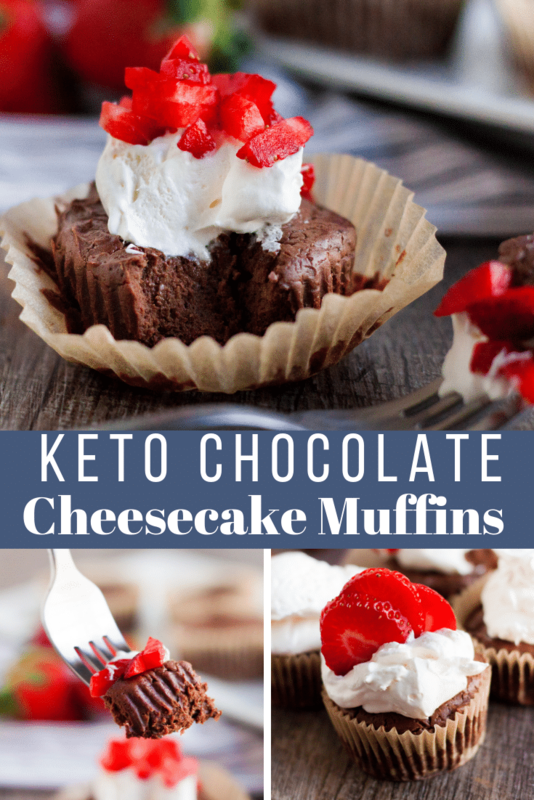 I’ve included links below to a couple of different Keto Cheesecake Muffins that are all amazing! 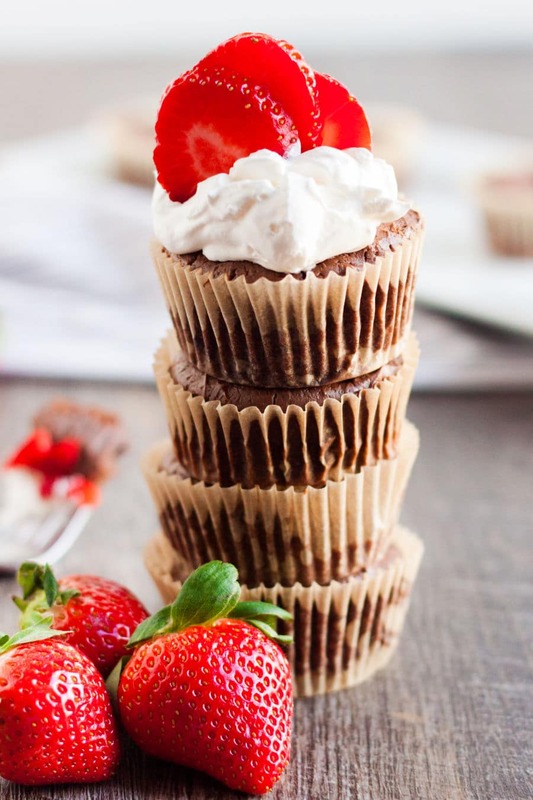 Keto Chocolate Cheesecake Muffins are the perfect way to satisfy cravings for a delicious and easy low carb dessert. 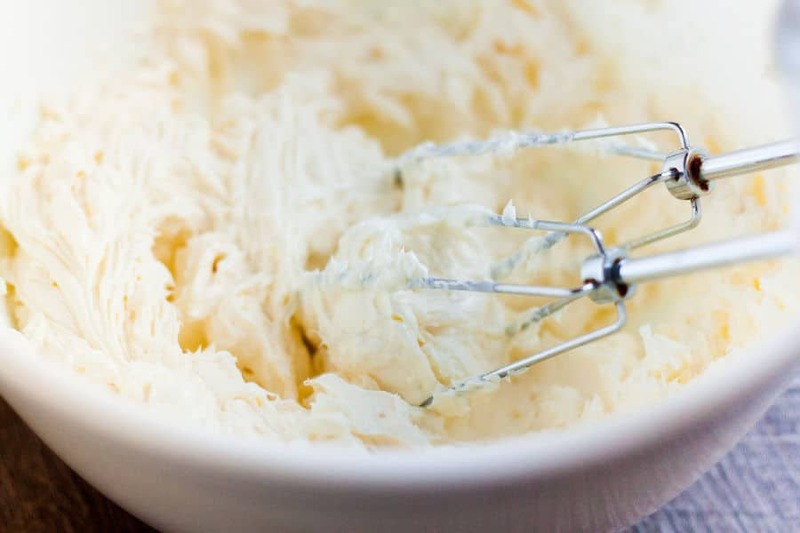 Soften cream cheese then beat with a mixer until smooth. 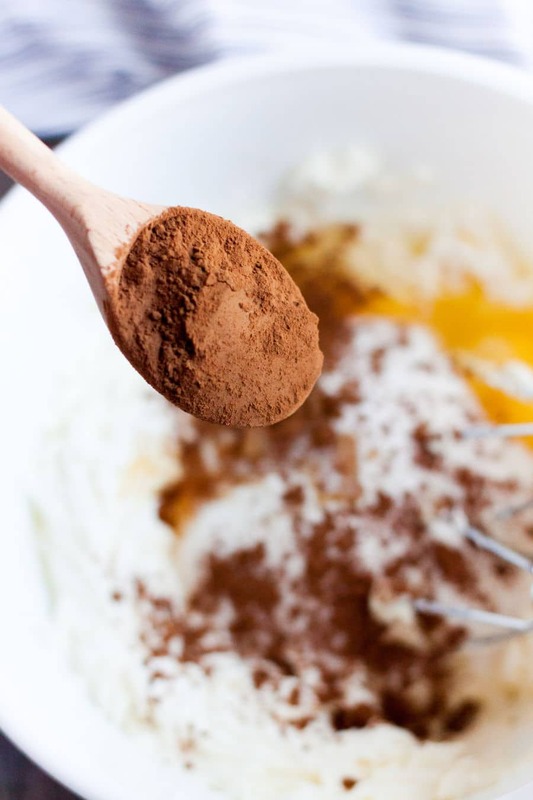 Add all other ingredients to cream cheese and mix on medium/high until completely combined and the mixture is smooth. Best served cold with a couple of fresh berries and a dollop of whipped topping. I love making and enjoying delicious Keto desserts! 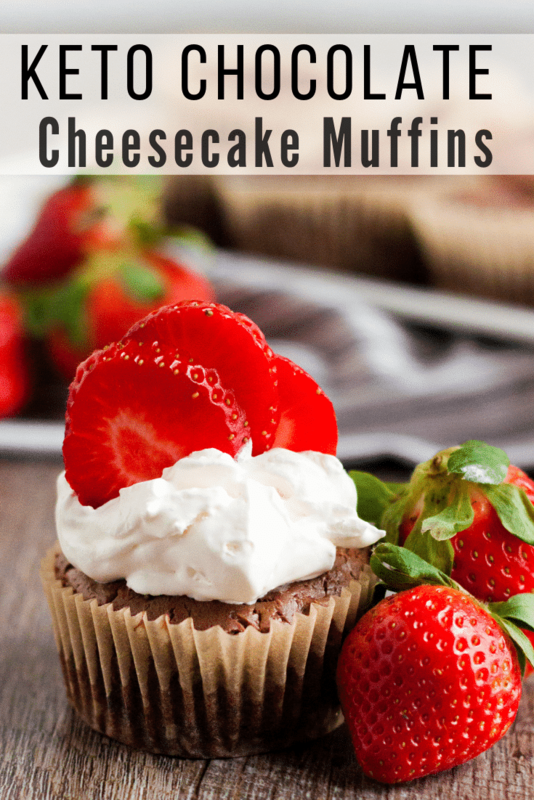 These keto cheesecakes are one of my favorites, but we have tons of other delicious and easy to make keto-friendly recipes. Here is our entire Keto Recipe Index for more ideas, or check out my personal favorites listed below. « Betty Crocker Hand Immersion Blender UNDER $17! can stevia be used instead of swerve? 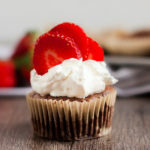 I don’t personally like Stevia in baking as I find it to bitter in baking so I can’t say from personal experience how it will turn out. I ran out of Swerve, so I used 1/4 swerve with 1/4 cup Splenda, and they taste delicious!! Wondering how that affects the carb count? I have only silicone cupcake holders. Do you think these will stick too much? I haven’t tried them but I have read comments from others who say that they work. It works beautifully! I like the way they pop out and you have a whole muffin. I’ve only made the recipe with Swerve or Monkfruit so I can’t say from personal experience how it will turn out with a different sweetener. Yes, I think Splenda gives a weird aftertaste in baking. What would you say about using Swerve confectioners IPO granulated? I was hoping for a “fluffier” muffin?! I’ve only tried as is, but it’s worth a shot. This is cheesecake so you may not get fluffier. Did you use regular size muffin cups or mini? I used regular muffin cups. Is that total carbs or net carbs? My grandson is type 1 diabetic so we have to count carbs but it has to be total carb count. Thank you! My hubby and oldest daughter are both type 1 diabetic. I would suggest entering all of the exact ingredients that you used into a carb app to determine total carb count. How do you store these? Can these go into the fridge for a few das or need to freeze ASAP? I get confused trying to calculate servings for one muffin? When I put the recipe in my fitness pal the carbs are way more than 4g (I got 11+ grams). Do the carbs in the swerve granulated not count because they’re erythritol? The carbs in swerve are sugar alcohols so they are subtracted. My Fitness Pal doesn’t know to do that. Do we use unsweetened cocoa? Do we use unsweetened cocoa powder or regular? I didn’t use the exact amount of cocoa the forst time I made them it was way too much, had to throw them away. The second time I made them they came out better. Not a dark chocolate fan, that could be my problem. Are these muffins supposed to be moist and fluffy ? Mine are, al.ost like a moose consistancy. I was hoping for more cake like texture. 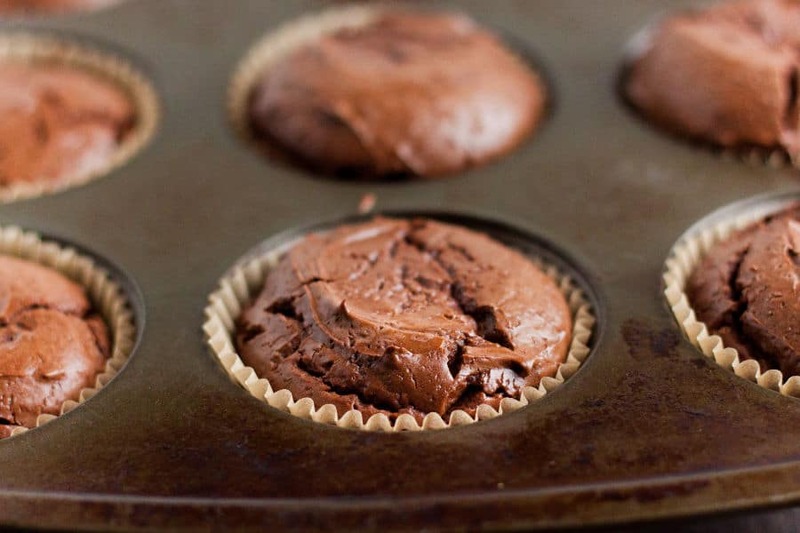 Yes, this recipe is for Chocolate Cheesecake in a muffin form. If you are looking for more of a cake consistency try this recipe. Hey, Barb sounds like you cooked them perfectly. They cave in a little when they start to cool. Glad you like them!! I’ve never tried it. Let me know how it turns out. This is the best low carb dessert I have made yet. My husband has been on the Keto diet for almost a year and my whole family loves them. I used Pyure in mine and the first time, it did have a little after taste. We found that we liked them better served warm with a dollop of Cool Whip on top and the after taste was completely gone. I store them in the refrigerator, but microwave to warm the up for serving before topping with the Cool Whip. what is monkfruit ? what brand of cocoa? This is all new to me. The Monkfruit is linked in the post so you can click and see the product on Amazon. Regular unsweetened cocoa. Hey Kasey, is the Monkfruit Classic a powdered sugar substitute or granular? I only have the Monkfruit Golden but have Swevre powdered. Thanks, I love your recipes! Monkfruit classic is the same as granular. Possibly but I’ve only tested it as is.